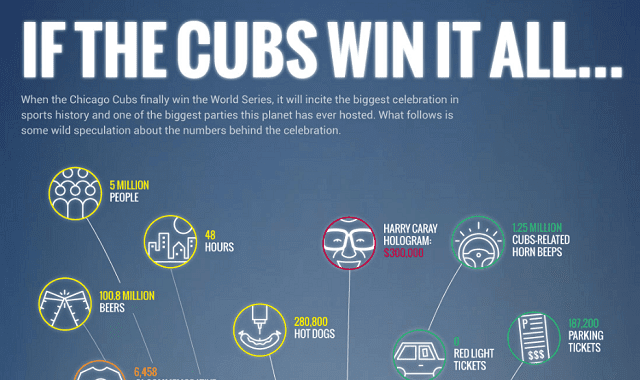 A Look at a Potential Chicago Cubs World Series Celebration #Infographic ~ Visualistan '+g+"
Is this the year the Chicago Cubs finally win it all? The last time the Chicago Cubs won the World Series was way back in 1908. Can you even imagine the celebration that will happen when the Chicago Cubs finally win the World Series? Not only will be one of the biggest parties and that the city of Chicago has ever seen, it will also be one of the biggest celebrations in the history of sports. Home Run Inn decided to take a look at just what a potential World Series celebration would look like by the numbers. They wanted to create a fun piece that was based similar celebration numbers for both the Chicago Blackhawks and also the Boston Red Sox. These numbers are mostly speculation at this point, but it is a fun look at what would happen. Any Chicago Cubs fan will get a kick out of this fun infographic.